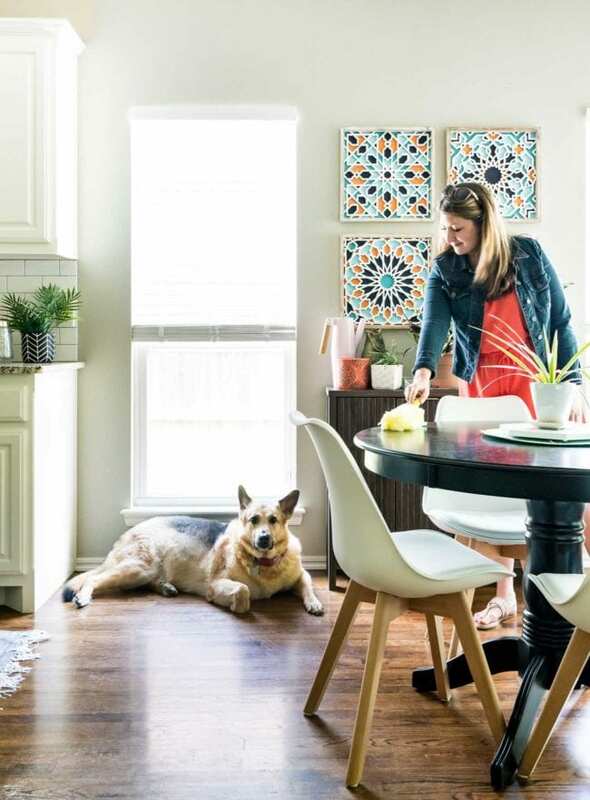 Improving indoor air quality (IAQ) sounds boring, but implementing some of these fixes will help your family breathe easier. 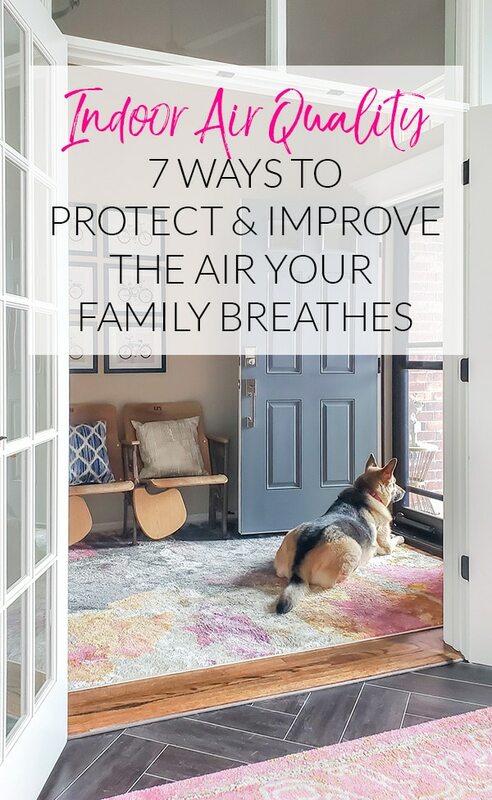 As the weather starts to get cooler and we spend more time indoors, I end up paying a bit more attention to an often overlooked but vital part of our home: the air we breathe! I was shocked when I found out studies have shown air pollution to be 100 times higher indoors than outdoors. I tend to approach this topic in our home from a place of awareness and moderation. While it’s AMAZING if you’re even more vigilant than we are with your indoor air and health, I also want you to know there also isn’t any shame coming from me no matter where you fall on the spectrum. There are still lifetimes of research to be done on how all the things around us individually impact our health. That said, my thought is that if it makes sense that something could be harmful and there is a way to mitigate that potential damage to our health, then we should take steps to do so. It’s like when I realize how extreme the calorie count is in certain fast foods or drinks. I suddenly order them WAY less often if at all. And if I do, I feel the need to work out to give my body something good in return. Kind of like eating and exercise, you control your air quality two ways…what goes into the air and what you can pull out of the air. 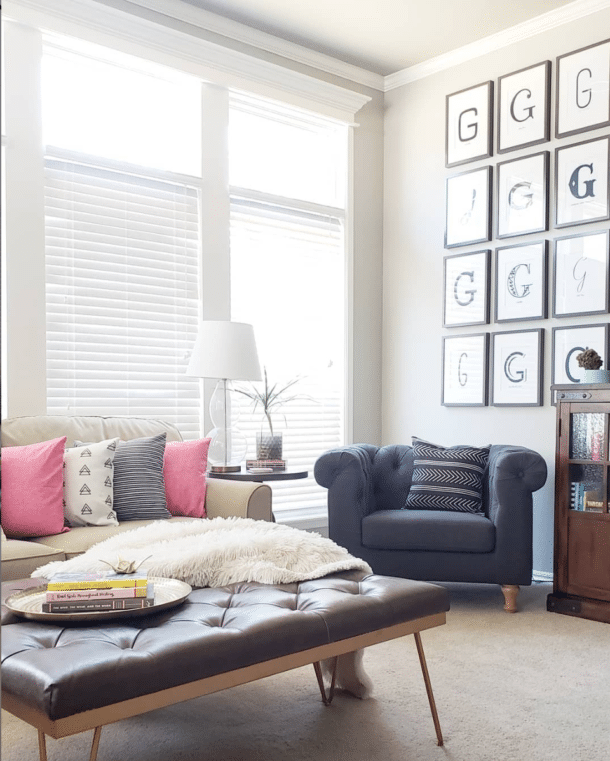 New Furniture and Rugs – Ever get something new delivered and felt overwhelmed by the smell when you unpackaged it? It’s crazy to think about inanimate objects letting off gases created during their production, but it happens. To reduce the impact in your home, consider doing the unboxing outside or in the open garage and then leaving the item to “breathe.” At a minimum, open all the windows in the room before unwrapping new large items. 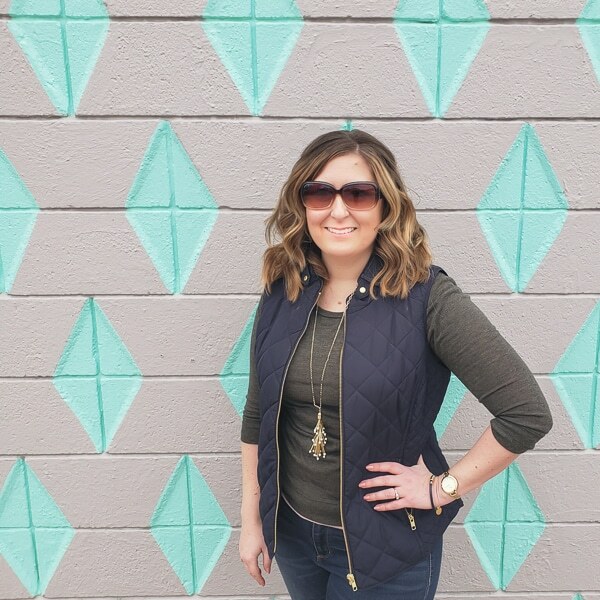 Choose NoVOC Paint – The availability of NoVOC paint has gone up while the price has come down over the last few years and that’s a big win for all of us! It’s more pleasant to use because it doesn’t have that strong paint smell, and it’s better for our lungs. However, you should still open the windows when painting. When debating the price of regular vs NoVOC, consider that the difference ends up being tiny fractions of a penny per day over the time you’ll keep the color on the wall. Cleaning Supplies – Whenever possible, use natural cleaning supplies over options that are full of chemicals. We’ve been making this change slowly over time. I try to think twice about anything I’m spraying into the air, including air fresheners. Pet Dander – Chemical pollutants aren’t the only problems. Dogs and cats create extra hair and dander throughout the house that’s tough on our lungs. Brushing them regularly outside combined with frequent vacuuming and dusting makes a huge difference. Change Air Filters Frequently – Life moves by fast. It’s easy to skip months when we’re supposed to be changing out our HVAC air filters. Corey has a repeating reminder on his phone now, and it’s helped us stay on schedule. PureAir™ S Purification System from Lennox – Speaking of your HVAC, my neighbor introduced me to something I never knew existed. She asked me to pop over to let a HVAC company in. They were coming to evaluate the home for a whole house air purification system to help with her young daughter’s allergies. It took me a while to answer her original question about letting the guy in because I had so many questions about the concept. Then life got busy. I forgot all about it until Lennox reached out asking if I could partner with them to spread the word about the PureAir™ S Air Purification System. I was eager to learn more myself and figured if I didn’t know about, there was a good chance I wasn’t the only one living in the dark about this awesome option. We haven’t used it at our house, but it’s going on our master list of home improvements we’d like to make in the future. The PureAir™ S is a smart whole-home solution that combats all three major types of indoor air contaminants – particles, germs, and odors. Other systems only tackle one or two of the contaminant types. To conquer all three indoor air pollution issues, the system uses both physical filters and UVA light. Removes 99.9% of mold spores, pollen, dust and pet dander. Removes or destroys up to 90% of flu and cold viruses, including infectious bacteria like MRSA and other living microorganisms down to 0.01 micron with hospital-grade filtration. Destroys household odors and volatile organic compounds (VOCs) from sources like cooking fumes, pets, cleaning supplies, paints and solvents, and carpeting and upholstery. We’ve had single room air purifiers before, and they were a big pain to maintain. It was a constant battle to keep the unit itself clean. The engineers at Lennox must have had that same experience because they added built-in sensors monitor the life of both the filter and the Purifier UVA light, so you don’t have to. When it’s time to change the filter or the Purifier, the PureAir™ S lets you know through your iComfort® S30 ultra smart thermostat. Brilliant! The more I research these units, the higher they go up our to-do list. I admit, I usually hate spending money on things that don’t impact the look of our home. But what could be a more important home improvement than cleaning the air we breathe every day and night? Find a dealer near you or you can learn more about how the PureAir™ S works here. Open the Windows! Unless you’re currently under an outdoor air quality advisory, there’s generally less pollution found outdoors than indoors. Opening the windows helps air circulate through your home and bring in some fresh air. With summer ending, it’s a great time to take advantage of the cooler mornings and evenings to air out the house. I’m working on remembering to do this more often myself! I need to attach it to some kind of mental cue, like opening the front door each morning when I work in the office (as the weather allows). Those are the top 7 things we’re doing or considering to improve the air in our home. Are you doing anything differently? I bet those of you with asthma or severe allergies in the family have even more ideas. I’d love you to take a minute to share them in the comments below. These are great tips! Definitely glad I read this because we’re in the process of building a new home and I want all the clean air! YES! I can’t remember if I included this in the post or just thought it, but I’m so bummed I didn’t know about this while we were building to make it a super-simple install for the PureAir system! It totally works to install them in built homes as well, but it seems like a no-brainer to go ahead and add it during construction when possible. 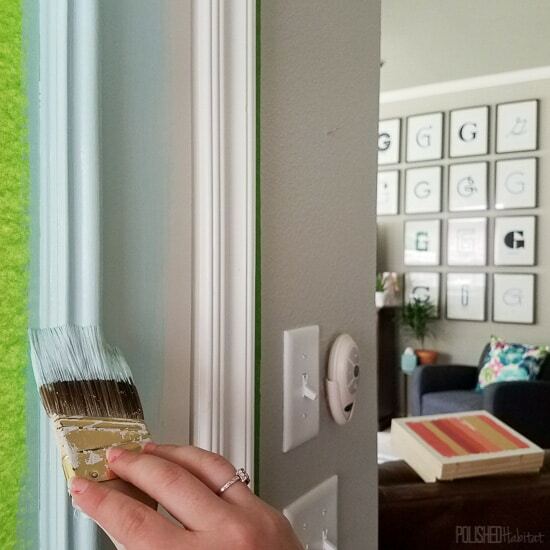 If you’re going for clean air in a new build, or if you can afford to replace windows, look into those windows with the blinds between two layers of glass. As the wife of someone with severe, persistent asthma I think they are the coolest things – which we unfortunately can’t have because we live in an apartment. But they would make a huge difference in amounts of dust and allergen accumulation. That is a brilliant suggestion, Amy! Our wood blinds get SO dusty and take so long to clean well! All great tips for improving air quality. I personally really like airing out the houe whenever the weather is nice. Yes! I actually had my front door open this morning before it got too hot! 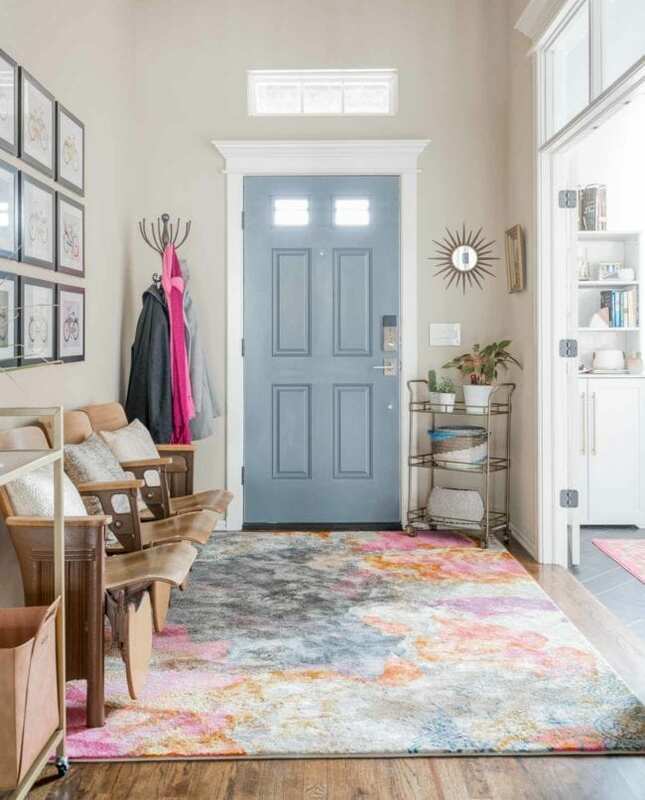 That entryway rug, though! It’s gorgeous. And I love the desk chairs. What an inviting space. Thank you! We bought that rug for the dining room, but it wasn’t quite right in the space. I was thrilled the day I thought to try it in the entry – it’s like it was made for the space!